This luxurious Ocean Ranch residence is situated on an expansive, half acre lot just minutes to the surf and sand. Beautiful remodel completed in 2018 with interiors by Blackband Design, every detail in this home was carefully considered and expertly crafted to a level simply without compare. Five bedrooms, five and half baths with approximately 5,900 square feet of living space, a separate office downstairs and additional media room / study for the children that could easily be converted to a 6 th bedroom. The great room incorporates the most fabulous open kitchen with all of the finest: 4 full size Sub-Zero refrigerators/freezers , 2 Bosch dishwashers, a Wolf range with 2 ovens , warming drawer, rare Calacatta Gold marble counters , an incredible pantry and an additional room to design a wine cellar! The formal dining room and living rooms, billiard room, 4 fireplaces and contemporary touches have been artfully mixed with classic architecture creating a comfortable design that is perfectly suited to the most discerning buyer. The master suite features two walk-in closets, full ocean view, balcony, private gym and craft room. No expense was spared in the ensuite bath with a steam shower and a freestanding jet therapy tub, surrounded by the most beautiful Thassos white marble, alabaster and blue onyx . The extensive grounds are complete with salt water pool, spa, outdoor fireplace and grill station. 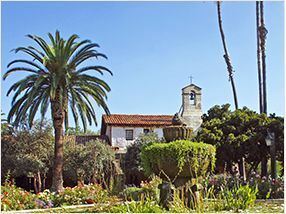 17 beautiful fruit and citrus trees with over 500 rose bushes decorate the gardens. Its breathtaking design is perfect for entertaining and living both indoors and out. Beautiful attention to every detail is evident throughout this estate property. Ocean Ranch is a secure, guard gated community with two 24-hour guarded gates and roving security. The community offers activities for residents throughout the year (Winter Wonderland, Halloween, Summerfest) in addition to the community pool, spa, sport court and playground. 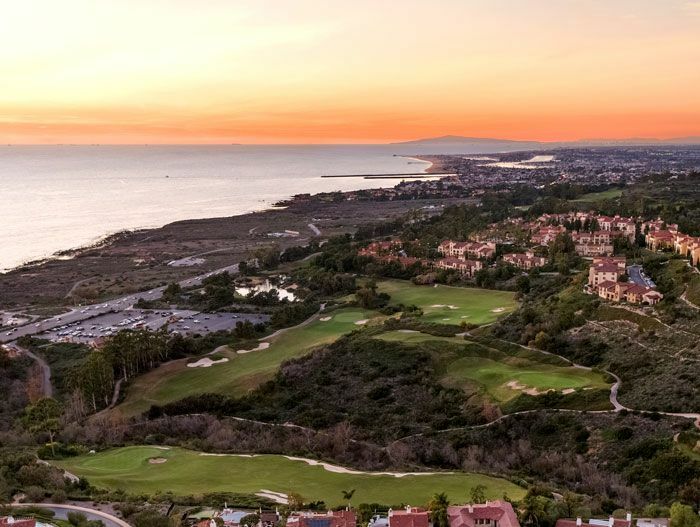 Laguna Niguel offers close proximity to the Monarch Beach Golf Links, the famous Ritz Carlton, Monarch Beach & Montage Resorts, Salt Creek & the Strand Beaches. Endless options await. Experience the ultimate California living experience from this amazing location. THE PERFECT FAMILY COMPOUND!!!! Do not miss this exceptional opportunity to own a piece of Laguna Beach history! Built in 1932, the main residence was originally the local library moved to Sun Valley Drive in the 1950's. A perfect marriage of vintage Spanish and vintage Laguna Beach charm, including contributions of past artist residents. Multiple serene and private spaces provide limitless possibilities for a live-work environment. Ideal for someone looking for a delightful family compound or guest house/rental opportunity. Situated on an expansive lot of almost one third of an acre, the charming two bedroom, two bathroom main house, with high ceilings and over-sized skylights bathe the rooms with light and stars at night. The kitchen flows to a sun room with herringbone brick flooring which could serve as an incredible gourmet pantry and prep kitchen for farm to table dining experiences al fresco. The gardens offer a variety of fruit trees and outdoor spaces for retreat and relaxation. A private pathway leads to an adorable vintage guest cottage, which extends out to its own private yard and patio. Additionally, a separate and versatile studio has been converted to a comfortable media room and functional office space with a separate private office next door, all equipped with air conditioning and new finishes. The convenient location allows you to escape the hustle and bustle while still close to town, local beaches, scenic hiking-biking trails and freeways. RESORT LIVING WITH NEVER-ENDING OCEAN VIEWS!!! 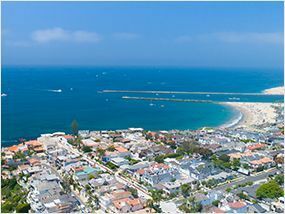 Located in the coastal enclave of the Regatta Dana Point on a prime cul-de-sac parcel, this 3 bedroom, 2 bath home enjoys expansive ocean views from the Strand to Catalina and Palos Verdes beyond! The expanded floor plan and picture windows open to a spacious terrace bringing the outdoors in for the ultimate beachside living experience. The home features an open concept kitchen with high quality, stainless steel appliances, new cabinetry, granite counter tops and cherry hardwood floors which flow to the living and dining rooms sharing the exceptional views. The gardens below with jacuzzi and waterfall allow for relaxing, private evenings with sunsets and ocean breezes after a long day at the beach! 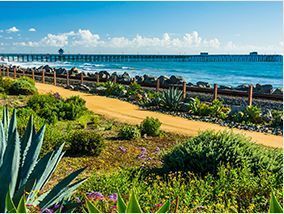 Surrounded by lush landscape, water features, koi fish, and turtles, enjoy sunsets at the ocean front park access to the beaches below! 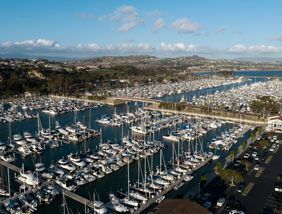 Dana Point offers amazing amenities such as the Monarch Beach Golf Links, the famous Ritz Carlton & Monarch Beach Resorts, Salt Creek & the Strand Beaches, or a private membership at the Monarch Bay Beach Club and close proximity to the new Lantern District and DP Harbor. 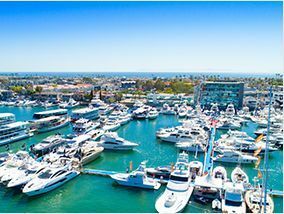 Discover your own reasons for falling in love with this coveted California Riviera location! THE PERFECT BEACH GETAWAY - in one of Laguna's gated, oceanfront communities! Exquisitely appointed and designed by architect Bob White, this home radiates a relaxed vibe with contemporary touches that have been artfully mixed with classic architecture creating a comfortable design that is perfectly suited to the seaside setting. The coastal interior offers high-end features including custom reclaimed wood flooring, board and batten walls and modern finishes. The moment you enter - the comfortable floor plan brings the outdoors in and sets the tone for a perfect holiday! Entertain or dine al fresco on one of the inviting ocean view decks with BBQ area, outdoor lounge & fireplace. The open kitchen equipped professional grade appliances, oversized island and butlers pantry will not disappoint. 4 bedrooms, 4.5 bathrooms with a separate media room and office space. The master bedroom and luxurious en suite is bathed in cool ocean breezes and warmed by the afternoon sun. WIFI & CABLE TV included. 2 outdoor showers equipped with hot water for rinsing off after a day at the beach. 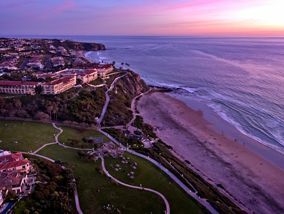 This special residence is only steps from the surf and sand located within the private, coastal enclave of Three Arch Bay – close to The Ritz Carlton, Monarch Beach & Montage Resorts, wonderful restaurants, galleries and shops. CALL for AVAILABILITY & RATES. SINGLE LEVEL LUXURY RENTAL – Impeccably designed new luxury retreat! This beautiful home radiates a relaxed, casual vibe with organic finishes surrounded by gardens and ocean views. 3 bedrooms, 3 bathrooms with all the amenities of a luxury resort. The coastal interior offers high-end design features including walnut wood flooring, custom beams, concrete fireplaces that will capture even the most discriminating guest. The moment you enter - the open floor plan and walls of glass bring the outdoors in for an exquisite experience. The interior living spaces open through sleek sliding doors to the outside complete with a firepit and lounge area to enjoy the home’s coveted California Riviera location. Entertain or dine al fresco in the back garden with sunset ocean views and peaceful gardens to relax. The open remodeled kitchen equipped with professional grade appliances, new cabinetry and an oversized island, sets the stage to the expansive living spaces with views of the surrounding nature and ocean. The peaceful master suite opens to a sumptuous soaking tub and meditation garden. Inside laundry, WIFI & CABLE TV included. This serene residence is only minutes from the surf and sand, golf and close to The Monarch Beach, Ritz Carlton and Montage Resorts, wonderful restaurants, galleries and shops. CALL for AVAILABILITY & RATES THIS SUMMER ONLY. Newly remodeled beach retreat! Located in the heart of Laguna Village and minutes to Laguna’s HIP District, this 2 bedroom, 2 bath home offers coastal living at its finest. The furnishings make for a relaxed and casual vibe featuring wood flooring and French doors opening to the outside. The gourmet kitchen with granite counters and new appliances is fully equipped with the modern conveniences of home. The master bedroom offers a comfortable queen size bed with an en suite bath. The secondary bedroom has 2 twin beds, separate bath and sliders opening to a private patio and cozy heater. Inside laundry, WiFi and Flat Screen TV's add to the modern amenities of this home. The large upper deck, fully equipped with BBQ, heating and comfortable seating allows for beautiful sunsets, cocktails or al fresco dining. Enjoy the outdoor living spaces on multiple patios with private relaxation and ocean views. 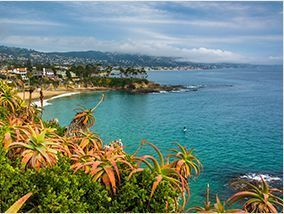 The home is just a few blocks away from downtown Laguna Beach where you can explore galleries, restaurants and shopping....all only minutes from your front door. Available on a short term basis: peak season at $7,500/month $6,000 low season. Seller to entertain offers between $519,900 - $549,900. Wonderful single level home in quiet neighborhood. Open floor plan with great room style layout. Upgraded kitchen with 3 pendant lights, oversized peninsula, gorgeous new white quartz counter-tops, white cabinets, stainless steel appliances, 5 top gas range, Recessed lighting and farmhouse style stainless sink. 3 year old solar panels (additional city approved panels to accommodate future air conditioning, etc.). Newer double paned energy efficient windows and French doors throughout instead of sliders. Large front door with lots of windows at entry. New natural wood laminate flooring and white baseboards throughout. Vaulted ceiling in living room. Laundry area with storage cabinets in garage with optional gas drier hook up. Walk-in closet and newly remodeled en-suite bath with pocket door and garden window. 2 car attached garage with newer manufactured material roll up garage door. Beautiful landscape including: Patio pavers, retaining wall, propane fire pit, water feature/Koi pond, rain barrels, Fully fenced, grass with gopher mesh underneath and automatic sprinkler system, 1 avocado, 2 orange and one lemon tree (all mature and abundantly producing fruit), tall privacy fence, large manufactured pergola (Low maintenance and no risk of termites), large cement patio for BBQ and tables etc. large open yard with lots of grass area with locking gates and separate trash area. Almost new, absolutely stunning home with over $80,000 in upgrades located within the beautiful gated community of Serra in the Foothills of Vista. Featuring open concept living space with upgraded kitchen, Caeserstone countertops, surround sound, security system, dual paned windows, custom window coverings, tankless water heater and vinyl plank flooring. Entertain in the inviting backyard with pergola, fire pit and dining area. A short walk to the community pool, playground and clubhouse. Immaculate home tucked away on a quiet cul-de-sac in Lake Rancho Viejo. Great curb appeal and low-maintenance landscaping with fully owned solar. Inside the sprawling 2 story home, you’ll admire all the finishing details in the flowing and naturally lit floorplan. Separate living areas include the formal living room, family room, dining room, and loft. The kitchen is equipped with gas cooking, granite counters, stainless steel appliances, beautiful cabinets with under cabinet lighting, pantry, center island, and is open to the family room that is warmed by a cozy fireplace. The oversized master bedroom has space for a sitting area with a large walk-in closet and ensuite bathroom with soaking tub, separate shower, and dual sinks. Enjoy the additional perks of the spacious laundry room with storage cabinets and 2-car finished garage. Escape to the backyard and relax under the large covered patio and enjoy the fully landscaped yard with AstroTurf and a large built-in BBQ area. Take advantage of the walking trails and playgrounds within the community. With all that this home has to offer it won’t stay on the market for long. Welcome to your future Ranch, Resort, Spa, or Estate! This European Masterpiece is an Architectural dream on 10 magnificent sweeping view acres, resort style pool and entertainer's dream pool house with large gourmet kitchen, and dining room, private lake, wells, 16 Stall First Class Equestrian facility, 3 Guest Houses, Vineyard, RV storage, and Car barn. MASTER is DOWNSTAIRS on 1st level in the main house with an extra bedroom and office! P erfect as is for a very special family, or scaleable to be the best wedding venue in all of San Diego, a high end Spa & Wellness Center, Church and Corporate Retreat or a High End Celebrity Caliber Rehabilitation Ranch. The entrance to the Main Residence is serene with flowing stream over a bridge to an antique door from France. The three story masterpiece was caringly built with all imported plank flooring, doors, tiles, marble, fixtures and finish details everywhere you eye takes you, even to the fabric lined walk in closets in every bedroom. The first level includes a formal living room, dining room, three offices, large en-suite Guest Room, 6 Fireplaces, enormous Master Retreat, Large scale Gourmet Kitchen, incredible Family Room with a fireplace so large you could actually stand in it and incredible beam work that resembles a quaint European chapel, wine room, sun room, beautiful laundry room and 4 car garage. The Second Level up includes 3 oversized en-suite bedrooms and bonus room while the third level has a bedroom suite large enough for a family or bridal party with a large beautiful bathroom with claw foot tub. Keeping with the European feel of the estate, the first and largest of the three Guest Houses is a 1500 SQFT, 2 Bedroom /1 Bath home with an additional oversized 4 car garage. The Second Guest House is a 1200 SQFT 1 Bedroom / 1 Bath Home above a 5 Car Garage adjacent to the tennis court and equally as charming as the main residence and the primary guest house. The Third Guest House is very nice as an additional Guest House or Staff Quarters, with 900 SQFT, 2 Bedrooms/1 Bath and is located near the First Class Equestrian Facility. The Equestrian facility is ideal, with 2 eight stall barns with in and outs, you can have a mare and stallion barn, a beautiful oval riding ring and a nice area just below the barn for full Grand Prix Field and plenty of covered parking for all equipment and supplies with beautiful tack and bathroom. Sotheby's International Realty® is a registered trademark licensed to Sotheby's International Realty Affiliates LLC. Each Sotheby's International Realty® office independently owned and operated. 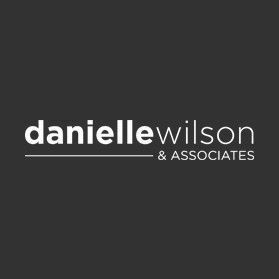 © 2019 Danielle Wilson & Associates - All rights Reserved. Thank you! We will review the information and get back to you shortly.